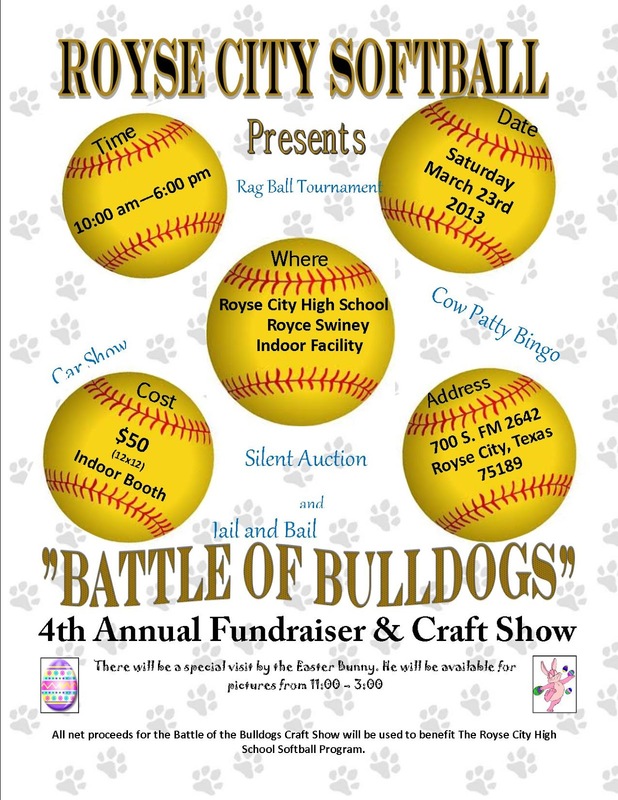 "The Royse City High School Softball Team Presents 'The 4th Annual Battle of the Bulldogs' Annual Fundraiser & Craft Show! 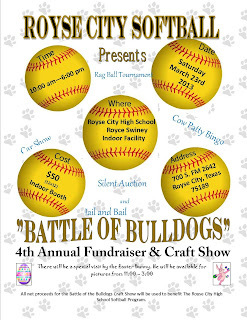 The Battle of the Bulldogs Event benefits the Royse City High School Girls Softball Teams. This is a Fun-Fulled day of events that is fun for all! The Indoor Craft Show runs all day and is located inside the Bulldogs Prctice Facility. Other events include a Classic Car Show, Live Music, Rag Ball (Softball) Tournament, Silent Auction, Cow Patty Bing, and a visit by the Easter Bunny!" Event held in the rear parking lots, softball fields and indoor practice facility. Booths are 12 X 12 and cost $50. Applications are available here and are due by February 21st, 2013. For more information, visit their website or contact their event coordinator at chris.wilkins1414@yahoo.com.